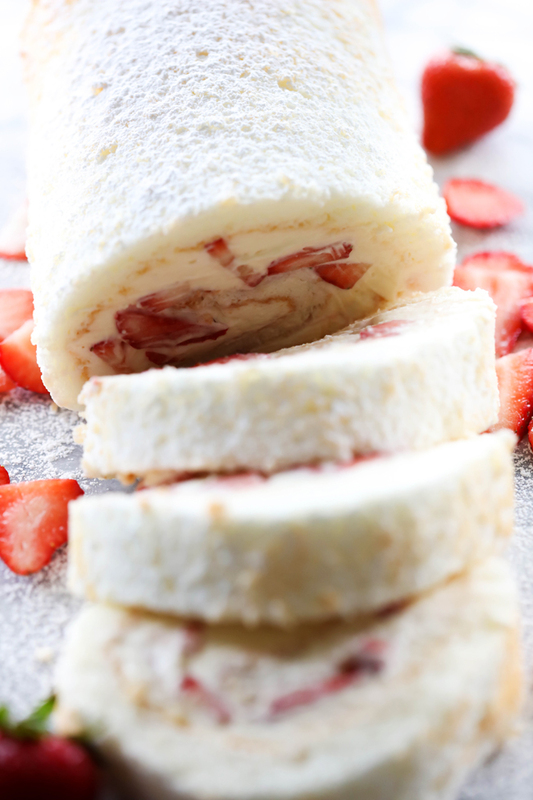 This Strawberry Shortcake Cream Roll is light, refreshing and the perfect treat to indulge in! 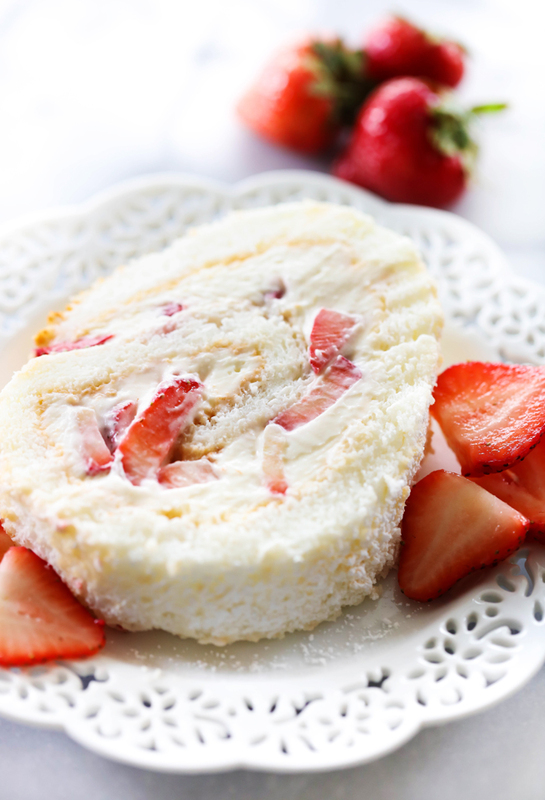 It begins with an angel food cake that is filled with cream and strawberries. This will be the hit of any gathering! One of my favorite treats this time of year is strawberry shortcakes. I love that they have a light texture which is exactly what I want when life gets warmer. My mom and I made this a few weeks ago and it has since been made a number of times. Strawberries are perfectly in season right now at the grocery store and this is one of my favorite ways to indulge with them. The cake begins with an angel food cake. I used a box mix just because it is easy and quick but also because I like the flavor. I have a homemade Angel Food Cake recipe here on the blog that is actually my favorite angel food cake recipe of all time. However, I am not quite sure how it translates to this recipe as I have never experimented with it before. The cake is not cooked in the traditional pan, but rather a jelly roll pan so there is room for error. If you end up trying the from-scratch-recipe, please let me know how it turns out for you :) But for reasons of quick, easy and tasty- I opted for the box for this particular recipe. The cream filling is simple abut the proportions and flavor are perfection. I could dip my strawberries in it all day long, but paired with the angel food cake it creates a match made in heaven. This dessert would be the a hit with any crowd and is surprisingly so simple to make! I would definitely encourage you to give this a try! Line a 15"x10" jelly roll pan with parchment paper. Prepare angel cake according to the instructions on the box. Pour batter into the lined jelly roll pan. Bake at 350 degrees F for 30-35 minutes or until golden brown and the cake springs back to the touch. Let cake rest in pan for 5 minutes. With a knife, carefully slide knife around the edges of the pan, making sure the cake is completely detatched from the pan. Invert cake onto a clean dish towel that has been sprinkled with powdered sugar. Carefully remove parchment and then place the pachment loosely over the cake again. Allow cake to cool for 10 minute like this and then roll it, starting with one of the short/narrow sides and rolling until you meet the other short/narrow side. While the cake is cooling make filling. Place cream cheese in a medium bowl and beat until smooth. Add powdered sugar and beat again. When the cake is completely cool, spread filling mixture evenly over cake. 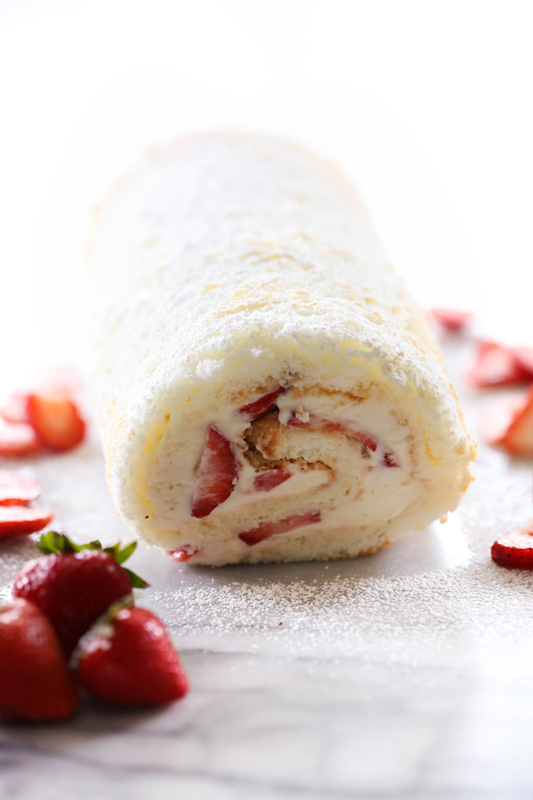 Place sliced strawberries over filling and roll again. By 'lengthwise' do you mean it should be rolled from a long side or from a short end? Thanks. I'm confused. I would roll this lengthwise across as the short to short ends would make it awful bulky, I think?? Looks delicious though, can't wait to try it. Are you to roll it up with the parchment paper so it doesn't stick or will it be okay without it? I want to know too. Also, do you leave it rolled up until you put the cream cheese mixture on and roll it back up again? I love the jelly rolls, even better with angel food cake. Am I supposed to whip the whipped cream before folding into the filling mixture? Do you roll it up with the parchment? And do you keep it rolled up until you are ready to put the filling on the cake?